1Department of Pediatrics, Inje University Haeundae Paik Hospital, Busan, Korea. 2Department of Radiology, Inje University Haeundae Paik Hospital, Busan, Korea. Received: January 15, 2016; Revised: February 28, 2016; Accepted: March 16, 2016; Published online: December 23, 2016. TO THE EDITOR: Cytomegalovirus (CMV) is a major cause of morbidity and mortality after transplantation. However, the risk of CMV infection increases with more intense treatment outside transplantation settings. We describe a case of fatal CMV disease in a pediatric patient with standard risk acute lymphoblastic leukemia (ALL). She developed life-threatening toxic megacolon and interstitial pneumonia, complicated with bacterial sepsis, during induction chemotherapy. With a diagnosis of ganciclovir (GCV)-resistant CMV disease, she was successfully treated with foscarnet and has remained in complete remission for >2 years. We discuss the association between CMV and immune suppression, the clinical utility of diagnostic tools, and CMV antiviral resistance. Cytomegalovirus is a commonly encountered viral infection following hematopoietic stem cell transplantation (HSCT). While CMV infection is occasionally characterized as asymptomatic or as a mononucleosis-like syndrome in immunocompetent hosts, the disease can be fatal in immunocompromised patients including transplant recipients. The disease results from a combination of altered cellular immunity, uncontrolled viral replication with multiorgan involvement, and end-organ disease secondary to direct viral cytopathic effects. While it rarely occurs in pediatric patients receiving only the chemotherapy, critically ill patients with a transient depression in immunity are predisposed to CMV reactivation [1, 2, 3]. Herein, we describe a pediatric patient with ALL who developed toxic megacolon and antiviral medication-resistant interstitial pneumonia caused by CMV reactivation. A 5-year-old girl with standard risk B-precursor ALL received induction chemotherapy according to established protocol . She was considered as a rapid early responder with M1 marrow on day 8 of induction chemotherapy consisting vincristine, dexamethasone, L-asparaginase, and intrathecal chemotherapy. On day 28 of induction, the patient developed fever and dyspnea. Further, her neutrophil counts had not recovered, and she complained of anorexia, nausea, and abdominal pain for a week, symptoms suggestive of vincristine-induced ileus. Physical examination revealed hypotension, shortness of breath, chest retraction, and abdominal distension. Her hemoglobin level was 8.9 g/dL, WBC count was 100 cells/µL, and platelet count was 51,000 cells/µL. Chest X-ray and computed tomography (CT) scans showed pneumonic consolidations suggestive of fungal pneumonia, and abdominal X-rays showed a gas-filled colonic dilation resembling toxic megacolon (Fig. 1). With the exception of blood cultures positive for Aeromonas sorbia infection, all serologic tests, and a C. difficile toxin assay showed nonspecific result. 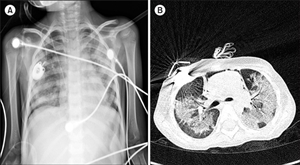 A bronchoalveolar lavage (BAL) could not confirm the cause of pneumonia. Despite the administration of broad-spectrum antibiotics, trimethoprim/sulfamethoxazole and voriconazole, and supportive treatment, the patient deteriorated rapidly and developed hypotensive shock associated with a large volume of hematochezia. After resuscitation, angiography detected active bleeding from the superior mesenteric artery, and despite embolizations, a considerable amount of hematochezia still continued, and the toxic megacolon persisted. A sigmoidoscopy performed on day 40 revealed severe ulcerative and hemorrhagic colitis involving entire sigmoid colon. Biopsies showed chronic inflammatory ulcers, and immunohistochemical staining for the CMV antigen was positive (Fig. 2). The presence of CMV antigenemia in three leukocytes and a reverse transcription-polymerase chain reaction (RT-PCR) based blood viral load of 4,260 copies/mL confirmed active CMV infection. Intravenous GCV dramatically improved the toxic megacolon and hematochezia. Despite becoming negative for CMV infection by antigenemia and RT-PCR analysis after 7 days of GCV treatment, and with negative test results for other pathogens, her pneumonia continued to worsen. Chest CT demonstrated increased multifocal patchy consolidations and ground-glass opacities in both lung fields (Fig. 3). Repeated bronchoscopy on day 55 detected CMV in the BAL fluid based on a qualitative PCR analysis. We suspected a GCV-resistant CMV pneumonia and changed her treatment to foscarnet, to which intravenous immunoglobulin was added every other day for 2 weeks. Her pneumonia gradually improved, and she was weaned from the ventilator on day 70. She subsequently made a full recovery and continued receiving chemotherapy, and has remained in remission for the last 24 months. CMV seropositivity, corticosteroid use, hypoalbuminemia, prolonged lymphocytopenia, bacterial pneumonia, and sepsis are known risk factors for CMV disease in critically ill patients [2, 3]. Intact cellular immune responses are essential in controlling acute CMV infection, and preventing recrudescence and end-organ disease. In patients with malignancies, lymphocytopenia is significantly associated with serious CMV pneumonia and gastrointestinal (GI) CMV disease, suggesting that chemotherapy-associated cellular immune dysfunction affects CMV reactivation [3, 5, 6]. Torres et al. reported that the site of CMV involvement in the GI varies with the type of cancer; particularly, colorectal involvement is more common in solid tumors, whereas upper GI tract involvement is more frequent in hematological malignancies. However, our patient exhibited upper GI tract-sparing severe CMV colitis. CMV disease also occurs more commonly at sites susceptible to tissue inflammation; GI disease occurs in patients with mucosal toxicity from chemotherapy, transplantation, graft-versus-host disease, or inflammatory bowel disease, whereas pneumonitis occurs more commonly in patients with pre-existing/coexistent pulmonary diseases . Our patient was treated with dexamethasone (6 mg/m2/day) for 28 days and showed persistent lymphocytopenia (>500 cells/µL) and neutropenia. She complained of nausea, frequent abdominal pain, gaseous distension, and constipation during induction chemotherapy, but we considered these as chemotherapy side effects. We could not identify the cause of her respiratory failure, and could not find any evidence of CMV pneumonia. However, we eventually diagnosed GCV-resistant CMV pneumonia, a suspected late reactivation of latent CMV infection following acute lung injury . The diagnoses of CMV colitis and CMV pneumonia in this patient were somewhat delayed. The toxic megacolon was too severe to perform colonoscopy, and the earlier gastrofibroscopic findings were normal. She had severe ulcerative colitis accompanying a life-threatening amount of hematochezia; although CMV antigenemia assay was positive in only three leukocytes, and the CMV viral load was 4,260 copies/mL. Following GCV treatment, the results of CMV antigenemia and PCR analyses continued to be negative throughout the course of disease; therefore, it was difficult to implicate CMV for the gradually worsening interstitial pneumonia. Consequently, repeated bronchoscopy with BAL was needed, and CMV pneumonia was eventually diagnosed. CMV end-organ disease diagnosis relies on the detection of CMV by one or more appropriate diagnostic tests, including culture, antigen detection by immunohisto-chemistry, histopathological examination, or in situ DNA hybridization, accompanied by signs and symptoms of the affected organs. The CMV antigenemia assay and quantitative PCR analysis have been increasingly used in recent years, as they are highly sensitive and non-invasive procedures that provide important prognostic information for patients at risk of developing CMV disease. Some reports have described a high risk of CMV end-organ disease in patients with high viral loads and/or persistent viremia , although in general, the detection of CMV by antigenemia or PCR analysis has not been a reliable predictor of CMV end-organ disease in settings outside transplantation. [9, 10]. While CMV antigenemia and blood CMV PCR show high levels of specificity for the diagnosis of CMV colitis (82% and 88%, respectively), the sensitivity values are low (47% and 44%, respectively) . Our case also showed that blood CMV antigenemia and PCR analyses are of limited clinical value in diagnosing CMV GI disease and pneumonia. When patients present symptoms of an unexplained end-organ disease, more aggressive investigations including gastrofibroscopy; colonoscopy; and bronchoscopy with biopsies should be performed [9, 10]. GCV is the first-line antiviral therapy for CMV infection in immunocompromised patients. Because of her early negative CMV-antigenemia and improvement in CMV colitis following GCV treatment, we suspected antiviral resistance at a much later stage due to her worsening pneumonia. In practice, CMV antiviral resistance is diagnosed based on increasing/high-plateaued viral load despite administration of adequate antiviral therapy for >2 weeks and is confirmed based on genotypic and/or phenotypic testing. However, clinical and virological resistance are not always linked, with virological resistance reported in less than 50% of the clinical resistance cases [11, 12]. Most cases of antiviral resistance are associated with severe CMV disease, higher previous viral load, long-term GCV use (usually >6 weeks), and delayed immune recovery, although resistance may also occur in patients with asymptomatic viremia [12, 13]. The most common (>95%) antiviral-resistant CMV strains contain mutations of the phosphotransferase UL97, conferring resistance to GCV, followed by mutations of the viral DNA polymerase UL54 associated with more severe resistance . Our patient experienced progressive pneumonia, and CMV PCR analysis of her BAL fluid remained positive after 2 weeks of GCV treatment. Although we did not perform genotypic testing, this was suggestive of clinical resistance. We consequently switched GCV to foscarnet empirically, and her pneumonia improved. The unusual occurrence of CMV infection in this patient emphasizes the importance of closely monitoring immunosuppressed patients receiving chemotherapy, including dexamethasone. The immunosuppressive effects of dexamethasone and bacterial sepsis may have reactivated a latent CMV infection and may have predisposed the patient to secondary infections and delayed immune recovery, thereby increasing the risk of a fatal outcome. Additionally, emerging drug-resistant viral mutations present new challenges to successful treatment. GCV is the drug of choice for CMV treatment; however, an extensive diagnostic workup is imperative when no clinical improvements are observed within 2 weeks. Furthermore, in suspected antiviral resistance cases, an antiviral therapy change should be considered early on. The patient developed fever, dyspnea, and abdominal distension on day 28 of induction. 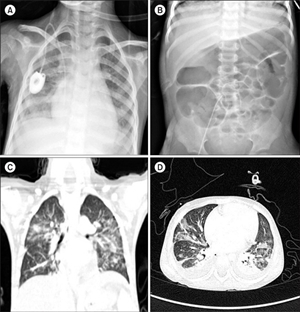 Chest X-ray (A) showed a newly developed pneumonic consolidation. Abdominal X-ray (B) showed a gas-filled colonic dilatation resembling toxic megacolon. A high-resolution computed tomography (HRCT; C, D) demonstrated the development of consolidations and ground-glass opacities in both lung fields. Sigmoidoscopy performed on day 40 revealed active bleeding with multiple hemorrhagic ulcers throughout the colon (A). Endoscopic biopsy revealed a chronic inflammatory ulcer (B). Histopathologic staining did not show any inclusion-bearing cells typical of CMV infection (owl's eye inclusions); however, immunohistochemical staining identified immunoreactivity for CMV antigen (C). Serial chest X-rays on day 54 showed progressive haziness in both lungs despite 2 weeks of ganciclovir treatment (A). Chest CT (B) on the same day (day 54) showed increased multifocal patchy consolidations and ground-glass opacities in both lung fields compared with previous chest CT images. Ng, AP, Worth, L, Chen, L, et al. Cytomegalovirus DNAemia and disease: incidence, natural history and management in settings other than allogeneic stem cell transplantation. Haematologica, 2005;90;1672-1679. Osawa, R, Singh, N. Cytomegalovirus infection in critically ill patients: a systematic review. Crit Care, 2009;13;R68. Torres, HA, Aguilera, E, Safdar, A, et al. Fatal cytomegalovirus pneumonia in patients with haematological malignancies: an autopsy-based case-control study. Clin Microbiol Infect, 2008;14;1160-1166. Mitchell, HR, Lu, X, Myers, RM, et al. Prospective, longitudinal assessment of quality of life in children from diagnosis to 3 months off treatment for standard risk acute lymphoblastic leukemia: Results of Children's Oncology Group study AALL0331. Int J Cancer, 2016;138;332-339. Jaber, S, Chanques, G, Borry, J, et al. Cytomegalovirus infection in critically ill patients: associated factors and consequences. Chest, 2005;127;233-241. Torres, HA, Kontoyiannis, DP, Bodey, GP, et al. Gastrointestinal cytomegalovirus disease in patients with cancer: a two decade experience in a tertiary care cancer center. Eur J Cancer, 2005;41;2268-2279. Cook, CH, Zhang, Y, McGuinness, BJ, Lahm, MC, Sedmak, DD, Ferguson, RM. Intra-abdominal bacterial infection reactivates latent pulmonary cytomegalovirus in immunocompetent mice. J Infect Dis, 2002;185;1395-1400. Gondo, H, Minematsu, T, Harada, M, et al. Cytomegalovirus (CMV) antigenaemia for rapid diagnosis and monitoring of CMV-associated disease after bone marrow transplantation. Br J Haematol, 1994;86;130-137. Green, ML, Leisenring, W, Stachel, D, et al. Efficacy of a viral load-based, risk-adapted, preemptive treatment strategy for prevention of cytomegalovirus disease after hematopoietic cell transplantation. Biol Blood Marrow Transplant, 2012;18;1687-1699. Ruell, J, Barnes, C, Mutton, K, et al. Active CMV disease does not always correlate with viral load detection. Bone Marrow Transplant, 2007;40;55-61. Kim, JW, Boo, SJ, Ye, BD, et al. Clinical utility of cytomegalovirus antigenemia assay and blood cytomegalovirus DNA PCR for cytomegaloviral colitis patients with moderate to severe ulcerative colitis. J Crohns Colitis, 2014;8;693-701. Hantz, S, Garnier-Geoffroy, F, Mazeron, MC, et al. Drug-resistant cytomegalovirus in transplant recipients: a French cohort study. J Antimicrob Chemother, 2010;65;2628-2640. Shmueli, E, Or, R, Shapira, MY, et al. High rate of cytomegalovirus drug resistance among patients receiving preemptive antiviral treatment after haploidentical stem cell transplantation. J Infect Dis, 2014;209;557-561. Le Page, AK, Jager, MM, Iwasenko, JM, Scott, GM, Alain, S, Rawlinson, WD. Clinical aspects of cytomegalovirus antiviral resistance in solid organ transplant recipients. Clin Infect Dis, 2013;56;1018-1029.